La marraqueta is probably the most popular bread in Chile, and una marraqueta is something many Chileans enjoy every day. 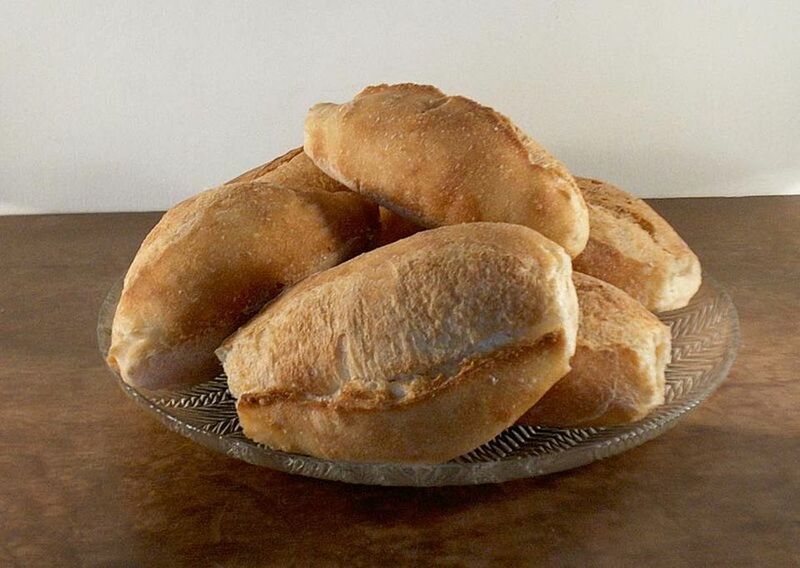 Marraquetas (also known as pan chileno, pan frances, and pan batido) are crusty rolls made with flour, water, yeast and salt, similar to French bread. Marraquetas are known for their distinctive shape which allows them to be easily divided into four parts. They are often rather large, about the size of 2 bagels, and are broken in half to make sandwiches. Chileans enjoy marraquetas for breakfast, as sandwich bread, toasted and spread with avocado, or as a dinner roll to dip or spread with pebre, a pepper sauce. La marraqueta is also traditional in Tacna, Peru, where they are served with the local specialty, Picante a la Tacneña. The dough for these rolls is easy to make (I like to start it in the bread machine), but shaping marraquetas can be a bit tricky. Basically, 2 balls of dough come together to form one large oval-shaped roll, with a long "corte" (or cut) lengthwise down the middle. Bakeries in Chile have special equipment to shape these rolls (watch a video of a "dobladora de marraquetas" here) that turns out perfect marraquetas, but you can make a reasonable facsimile of the same shape at home. To make this dough in the bread machine, place all of these ingredients in the machine according to manufacturer's directions. Run the dough cycle, and let dough rest in the machine until ready to use (up to 12 hours). The longer the dough rests, the more complex the flavor will be. To prepare dough in a mixer: Place the flour in the bowl of a standing mixer and use the dough hook attachment to mix them together briefly. Add the remaining ingredients, and using the dough hook attachment, begin to knead them together. Knead until dough comes together in a ball, adding a tablespoon or two more water if necessary, or some extra flour if the dough seems too wet. The dough should form a stretchy yet firm ball. Continue to knead dough until it is smooth, elastic, and no longer sticky, about 10 minutes. Place dough in an oiled bowl, cover with a towel or plastic wrap, and let rise in a warm place until doubled in size. Dough can be refrigerated overnight at this stage, which will also improve the flavor. Punch dough down and divide into 10 equal pieces (100 grams each). Roll each piece into a smooth ball. Take two balls of dough and place them side by side, touching closely, to form an oval. Roll the oval on the counter, horizontally, to help stick the two balls of dough together. Let the paired balls of dough rest for 5 minutes, covered with a damp towel. Preheat the oven to 400 F. Use a rolling pin to flatten the paired dough balls into a flat oval shape, by rolling over them lengthwise in both directions. Turn the oval 90 degrees and run the rolling pin over it again. Place the flattened dough onto a baking sheet lined with parchment. Use a pizza cutter to make a line from end to end, lengthwise, cutting deeply but not all the way through. Repeat with remaining dough, until you have 5 flat, double rolls on the baking sheet. Just before placing the rolls in the oven, use the side of your hand or the tips of your fingers to press down on the cut made with the pizza cutter, pressing down firmly to completely flatten the dough along this groove. Place the rolls in the oven. Scatter 1 cup of ice cubes in the bottom of the oven to create steam. Bake rolls for 15 to 20 minutes, until golden and crusty. Makes 5 large (double) rolls.